A twenty-two story tall commercial tower perched on a two-storey podium, is slated to break ground during the first week of December 2006 in the heart of Business Bay in Dubai. The building comprises 300,000 square feet and is a collaboration between RUR Architecture of New York and developer Shabah Lutfi. The building, O-14, will be located along the extension of Dubai Creek, occupying a prominent location on the waterfront esplanade. 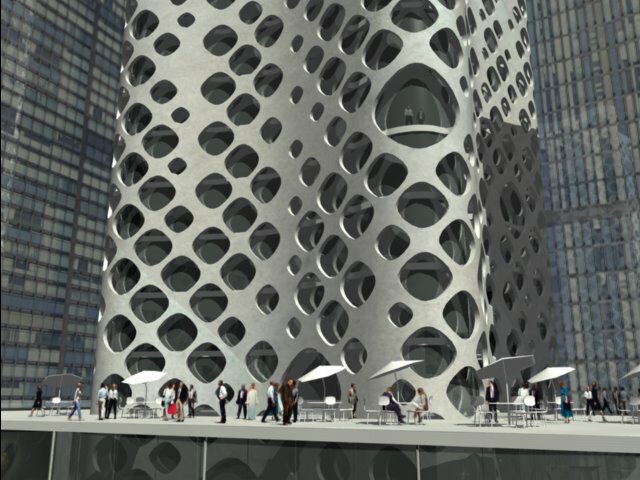 The design for O-14 is for a tower sheathed in a forty centimeter-thick concrete shell perforated by over 1,000 openings that create a lace-like effect on the building’s façade. 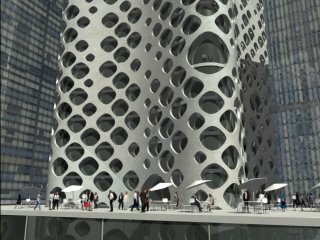 The shell is not only the structure of the building, it acts as a sunscreen open to light, air, and views. The openings on the shell modulate depending on structural requirements, views, sun exposure, and luminosity. A space nearly one meter deep between the shell and the main enclosure creates a so-called “chimney effect,” a phenomenon whereby hot air has room to rise and effectively cools the surface of the glass windows behind the perforated shell. This passive solar technique essentially contributes to a natural component to the cooling system for O-14, thus reducing energy consumption and costs, just one of many innovative aspects of the building’s design. The concrete shell of O-14 also provides an efficient structure that frees the core from the burden of lateral forces and creates highly efficient, column-free open spaces in the building’s interior. Each floor of O-14 has been already been sold to future tenants who can arrange the flexible floor space according to their individual needs.